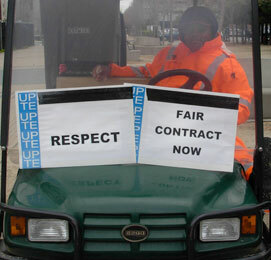 UC’s 13,000 patient care technical workers, represented by AFSCME 3299, have voted by a 97% margin to authorize a strike. The vote comes after nearly a year of negotiations, during which AFSCME’s elected bargaining team says UC refused to make “significant movement” on fair pay, retirement or staffing issues. A neutral fact-finder had previously agreed with the union’s position. UPTE-CWA’s 12,000 health care professionals, techs and researchers are facing similar intransigence from UC bargainers, as are the system’s nursing staff, represented by the California Nurses Association. On May 1 -- International Workers’ Day -- UCLA students gathered to protest the university’s actions towards its staff. The Daily Bruin reports that the students marched to Murphy Hall, where they occupied the second floor hallway outside the chancellor’s office and read a letter opposing UC’s proposals for a two-tier pension plan and other regressive measures. After the university's Council of Chancellors voted last week to allow campuses to withdraw from the UC Student Health Insurance Plan (UC SHIP), Berkeley Chancellor Robert Birgeneau announced the campus is jumping SHIP as of fall and returning to its earlier campus-specific plan. Riverside, Davis, Santa Barbara, and Irvine are expected to follow. SHIP had accumulated a $57.4 million debt since 2010, and students had protested the system's lifetime cap on coverage and annual pharmacy cap. The chancellors also agreed "to eliminate the lifetime coverage limit and other caps [such as pharmacy] on essential health benefits in the student health insurance program."